Creativity & Innovation, Costing, Marketing, and Communication. 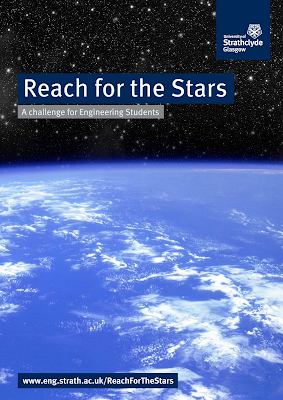 Student teams will be asked to register to take part in the competition. Registration will run from 9th January 2012 at 09.00 (Indian Standard Time) until 17.00 IST on 24th January 2012. 200 teams will be selected at random to take part in the challenge. The challenge will be posted on Saturday 28th of January 2012 at 09.00 IST and students will be asked to have their presentations uploaded to YouTube by 09.00 IST on Sunday 29th January 2012. 5 teams will be selected to go to the next round and these finalists will be announced no later than 7th February. 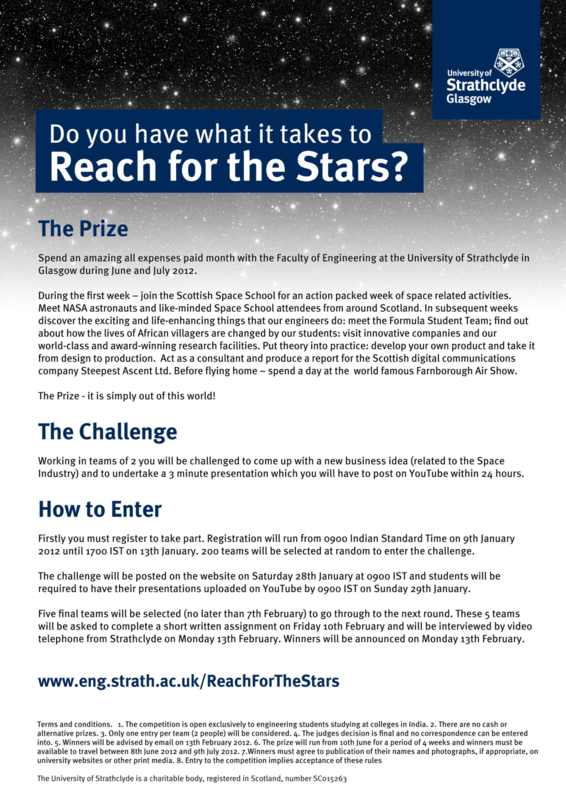 Finalists will be asked to complete a short written assessment on Friday 10th February and will be interviewed (by video telephone from Strathclyde) on Monday 13th February 2012 and the individual prize winners and the runners-up will be selected and announced on that day. 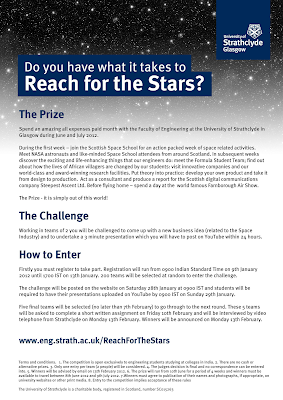 The prize consists of a fully funded month-long trip to The University of Strathclyde in Glasgow during June - July 2012. Sunday 10th June The Scottish Space School Week - an amazing week of space-related activity: meet NASA astronauts; be challenged as an individual and as a team member on space -related challenges. Meet like-minded Scottish Space School attendees from all around Scotland. It is an out of this world experience! Monday 18th June Strathclyde Engineering Week - Discover all of the interesting, exciting and life-enhancing things that Strathclyde Engineers do: interact with the Formula Student Team; find out about our Engineering for Development projects - how the lives of African villagers are changed by our students; Visit the innovative Edinburgh company Think Tank Maths. Look at our off-campus world class research facility The Advanced Forming Research Centre: Meet the researchers at our award winning Advanced Space Concepts Lab. Monday 25th June Accelerate Programme - This is your chance to put theory in to practice! From design to production - find out all about it. Work in a team to design and build your very own product. Meet new friends and take part in recreational activities. Monday 2nd July Steepest Ascent Consultancy Week - This company was established in 2004 by engineers with extensive knowledge of DSP and digital communications systems and exploitable wireless/ mobile and DSP software IP. Put everything you have learned in the past weeks into practice and work as a team to produce a consultancy report for the company on the exciting area of cube satellites. Finally you will be given the opportunity to spend an afternoon at The Farnborough Airshow (Monday 9th July) before flying home.